Fitting hearing aids for any hearing loss is a scientific process that can take an audiologist a few visits and adjustments to get correct. It can be even more difficult if the patient has high frequency hearing loss. But with the latest technology and the hope of frequency lowering hearing aids patients with high frequency hearing loss may have better options. High frequency hearing loss affects an individuals ability to understand speech. That's because although they can hear vowels fairly well, consonants like F, T, S, and TH are harder to pick out and comprehend. In addition higher sounds like female or child voices can also rise into the incomprehensible registers making it hard for someone with this type of hearing loss to communicate with females or children. Hearing aids with higher bandwidths were once thought to be a solution for this problem as they provided more amplification, but this has not provided a full solution as amplification of lower sounds would often be distracting and could cause increased whistling. The solution for those with higher frequency hearing loss seems to lie in frequency lowering hearing aids. Frequency lowering hearing aids filters sounds in the higher registers to the lower registers making them available for those people who still have hearing in the lower registers. There are currently a few different algorithms vying for the spot of best way to lower frequency, you can read about these different options on Listening and Spoken Language. Still, the basic idea with frequency lowering hearing aids is to alter sounds in higher registers and feed them to the lower registers. Although frequency lowering hearing aids are available, patients should realize that the preprogrammed algorithm programs often requiring tweaking by an audiologist. Your audiologist should use Real Ear Measure or REM to identify your specific hearing loss needs and adjust your hearing aids accordingly. As noted by Ruth Bentler, PhD, CCC-A, in her article Frequency-Lowering Hearing Aids: Verification Tools and Research Needson recently published by ASHA, "Real ear measures provide both visual verification and documentation that audibility was optimized." In the past, hearing aids that were adjusted for high frequency hearing loss would make some sounds too loud and would cause issues with whistling. Today's use of computer chips in hearing aids means they can be fine tuned and programmed to increase high frequency sound while not increasing other sounds. 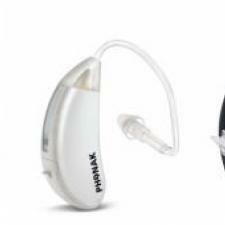 Phonak's Exelia is one example of hearing aids that work well with high frequency hearing loss. The Exelia line uses SoundRecover, an "effective way to extend hearing by restoring high-frequency sounds that would otherwise be inaudible."